MINNIE'S PINK LOOK GETS A BACKLASH! TV personality Minnie Dlamini seems to be receiving a lot of bad reviews with her style of late to an extend where people wonder if it is marriage that is doing this to her. Twitter users where not impressed at all with Minnie's look for the E! 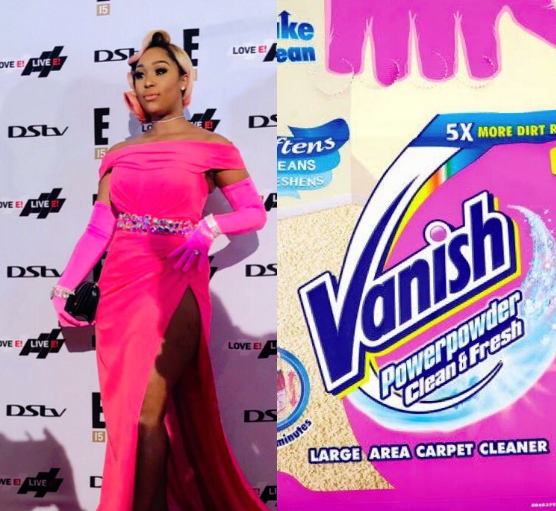 Pop of Culture awards they even compared her to Vanish washing powder. The last time Minnie rocked a dress at the GH Mumm event in Cape Town by Gert Johan Coetzee, social media was also not having it and she came to defend herself on twitter but this time she remains mum. Akawrongo uMinie it took me very long to see that this is her ?????? She looks like a hot mess drag queen, the bling is too damn much considering the 2 shades of pink is already too much for the eye, those pink pumps are also another shade... Yey Kubi maan, the dress does absolutely nothing for her body. She reminds me of Lady Zamar?? I blame SABC Sports. Phela nkare Ke chappies ya watermelon. ? ?